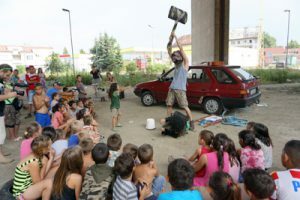 Summer festival of the different Slovak theater and the bold spectator. 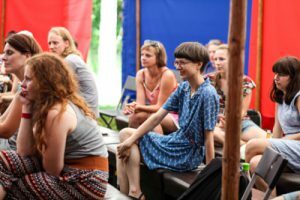 The activity originally initiated by the Theater Institute in Bratislava grew into the festival form and since 2008 has been an in-house product of the Stanica cultural center. It takes place annually on the last weekend of July. 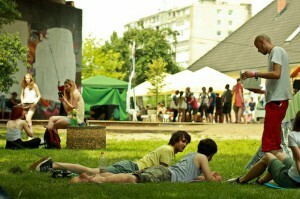 Kiosk is a festival of current production of the Slovak independent theater and dance scene. The program planning of the festival focuses on theater, dance and performance art which use original and groundbreaking form to solve current contents of art and social problems. We invite authors and spectators with the courage to search, to be authentic, genuine, original and current. We present creators interested in critical thinking about the world. Rather than tried and comfortable quality, we present marginal forms which educate and bring novelty to creators as well as spectators. After last year’s search for new spectator, this edition of the festival will focus on examining process as it often is more exciting than the result itself. Paths unbeaten, opinions differ, experiments may fail or succeed. Processuality, experiment and improvisation create dynamic art dialogue, often across several media. 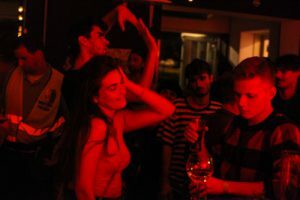 Therefore we’re going to see more of open, work in progress, raw projects, crossing the boundaries of genre and stage, audio–visual performances, virtual reality overlaps, site-specific installations and performative lectures. Discussions, equally important within the program, will be asking what the research means in art, to what extent is process creative activity and whether and how to understand the border line between legitimate imperfection and artificial postmodern game. This year’s theme is not at all coincidental. Last summer Kiosk reached 10th year of its existence, so this edition can be perceived as the first one again. It’s shaping over, developing, trying out how far it can go, reaching where it did not dare to reach before. It’s dynamic and alive, in process.